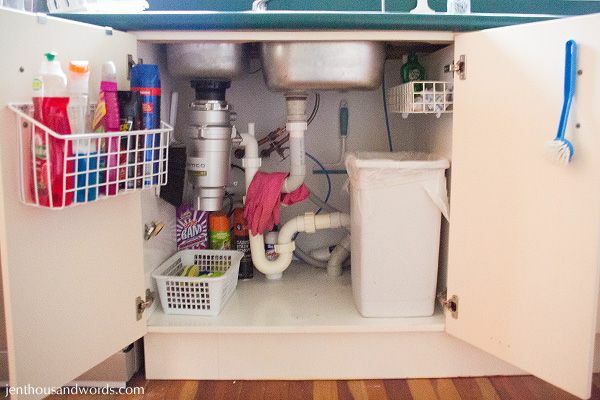 We don't have any space for shelves under there as there's a waste disposal unit, lots of pipes, and the rubbish bin. So I made sure, when organising it, to utilise the backs of the doors and the walls. As you can see, I added wire baskets - the one on the left holds our cleaning sprays and fly spray; the one on the right holds rinse aid (at the back) and dishwasher tablets. I added a nail to the door for the dish brush, a nail at the back for the squeegee, and nails on the left for the plugs, dustpan, and brush. 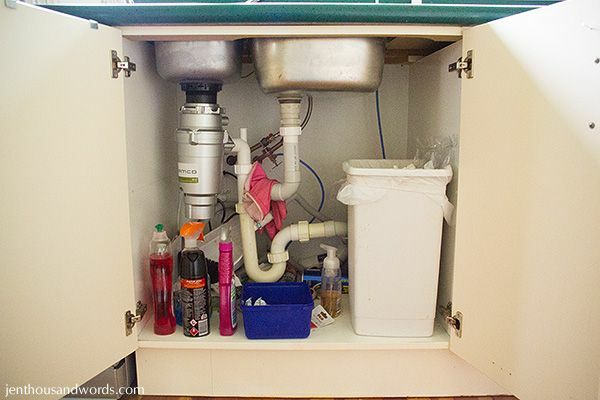 At the back I store seldom-used things like drain unblocker, oven cleaner, etc. The basket on the left holds sponges, scourers and spare scrubbing brushes.